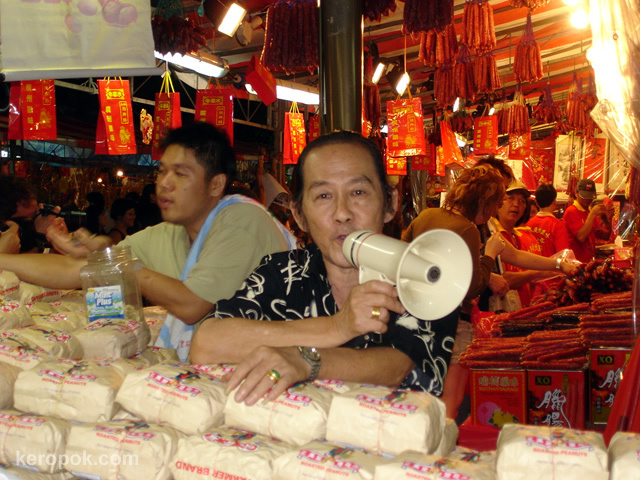 'Boring' Singapore City Photo: Loud hailer shouting: Lai ah Lai ah.. Posting from outside Singapore. Thank goodness parents have broadband. Wishing all Chinese people reading this, have a great reunion dinner. Chinese all around the world, would rush home to be with families, yes, a whole big clan like thingy, all your uncles, aunties, cousins, nieces, nephews, all eating together and spending time catching up and giving/receiving 'ang pows' (Red Packets filled with money). Got to rush off soon after posting this, going to travel around 45 mins to Grandma's place. It will be a fabulous time! He's selling nuts. Those packets are packs of nuts. It's also the same stall selling the various melon seeds and other nuts in the last few day's posting. kong hei, kong hei! hope you're having a great time celebrating. Happy Chinese New Year Keropok, all the best. lovely, festive atmosphere there, have lots of fun over the holidays. I love the market photos. Great shot. This is a funny portrait!